Become a GREAT NEIGHBOR today! engage local farms and growers to provide the freshest fruits and vegetables possible year-round. keep children fed even when school is out. bring food directly to the doors of home-bound seniors. provide hot meals to men and women who are homeless or cannot cook for themselves. **The Great Neighbor Program runs Jan. 1—Dec. 31. Recognition begins when the $5,000 threshold is committed. To participate in benefit recognition, pledges must be received by Sept. 1. 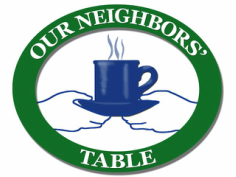 Important note: Our Neighbors' Table does not endorse goods or services provided by members of the Great Neighbor Program or of any other businesses. Recognition of our Great Neighbors acknowledges the role that the recognized business is playing in helping us to eliminate hunger in our region. Specific products and/or services will not be included in recognition activities.